We continue with our Earth Day campaign - 41 Reasons to Plant a Tree for Your Book, where we share with you 41 reasons provided by readers in celebration of the upcoming 41st anniversary of Earth Day. This post was supposed to be published yesterday so I apologize for the delay (well, it was Sunday..). With more than 180,000 trees planted so far on behalf of readers, authors and publishers working with Eco-Libris, it's no surprise that we think planting trees to green up books is a great idea.. But we also want to hear what readers think about it and why they believe planting trees for their books is a good idea. So for 41 days until Earth Day, we publish here the 41 best replies we receive, one reply a day. All replies are gathered and presented on the campaign's page. Thank you Kevin for sharing with us your thoughts on planting trees for your book! Kevin, just like all the other readers whose replies we'll publish, is winning one of the great 41 prizes we give away on this campaign, courtesy of our partners. Winners can choose their prize from a great list of gifts including audiobooks from Simon & Schuster Audio (such as The Half Life by Jennifer Weiner, Left Neglected by Lisa Genova and Essence of Happiness by the Dalai Lama) and great books, like Planet Home by Jeffrey Hollender, Spit That Out! by Paige Wolf, Menu Dating by Tristan Coopersmith and The Healthy Home by Dave Wentz and Dr. Myron Wentz. You can see the full list of the prizes on the campaign's page. Every day we'll give further details on one of the prizes. 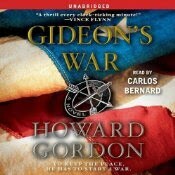 Today we present you with the audiobook Gideon's War by Howard Gordon. Gideon's War - Howard Gordon - the longtime executive producer of the hit TV series — makes his fiction debut with a tale of political intrigue and international terrorism. Gideon Davis has just 48 hours to bring his rogue agent brother in—before a twisted global conspiracy turns deadly. GIDEON DAVIS, whose behind-the-scenes negotiating skills have earned him the role of peacemaker in conflicts around the globe, knows more about hush-hush discussions in Capitol corridors than he does about hand-to-hand combat. But his more practical, tactical skills come into play when he’s called on by family friend and government bigwig Earl Parker to chaperone a rogue agent from Southeast Asia to D.C. The agent, Tillman Davis, has promised to turn himself in— but only to his brother, Gideon. Although the two brothers have been estranged for years, Gideon cannot fathom how his brother could have turned into so ruthless a man. But when the plan for Tillman’s surrender goes awry and Earl Parker is taken hostage, Gideon is forced to embrace his dark side in order to evade hostile locals in war-torn Mohan to make his way to the Obelisk—the multimillion-dollar, state-of-the-art oil rig that has been seized by terrorists led by Tillman himself. It is with the help of oil rig manager Kate Murphy that Gideon launches an unlikely one-man rescue. If you want to participate in the campaign, we still have some spots available so please send us your reply it to info@ecolibris.net. We look forward to hearing from you. Plant a tree for a book so that future generations of creative writers will have something in which to marvel.